Toyota Motor Philippines has unveiled the all-new Rav4 here in the Philippines! The updated crossover SUV boasts design, performance, and capabilities powered by the Toyota New Global Architecture (TNGA), a platform that applies the company’s principles and technologies to improve the vehicles’ agility, stability, and visibility. The all-new 2019 Rav4 comes with a lowered center of gravity and high rigidity body structure. It also features a lower belt line and repositioned outer mirrors. The thinner, low-set instrument panel flaunts sleek horizontal lines flowing into the door panels. Powering this vehicle is a newly developed front and rear suspension, along with a 2.5L Dynamic Force Engine with Dual VVT-i with VVT-iE. Paired with the new engine is a direct shift 8-speed automatic transmission with a multi-plate lock-up clutch. The fifth-generation Rav4 had a major design facelift and now sports a lot of updated features. Sportier, this SUV has a ‘cross-octagon’ exterior styling with a wide wedge-shaped front. The two-tiered upper and lower trapezoid-shaped grille adds to this Toyota vehicle”s strong vibe. There’s option for a 17-inch or an 18-inch allow wheels, too. 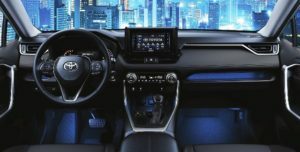 Inside the Toyota Rav4 are the 7-inch multi-information display that can switch between analog and digital modes. You also get a wireless charger, 8-way power adjustable driver’s seat with memory and lumbar support, and an inside rear view mirror. Accessories such as seat heaters, soft-touch dashboard and panels, rear cooler, leather seats, and panoramic sunroof are also available. 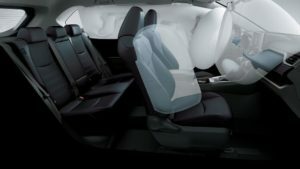 For safety, the Rav4 has seven airbags, 8-eye front and rears sensor, and back-up cameras. There’s also an anti-lock brake system with emergency brake signal as well as Vehicle Stability Control. 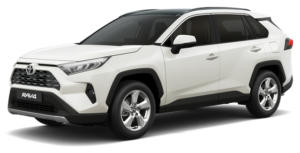 You can get the all-new Toyota Rav4 comes in six standard colors–White Pearl, Red Mica Metallic, Silver Metallic, Gray Metallic, Urban Khaki, and Cyan Metallic. Three special color variants–Super White, Attitude Black, and Dark Blue Mica Metallic–are available for special order with approximately three months delivery time.